My wife and I love to shop the thrift stores and we are always on the look out for something unusual or useful. 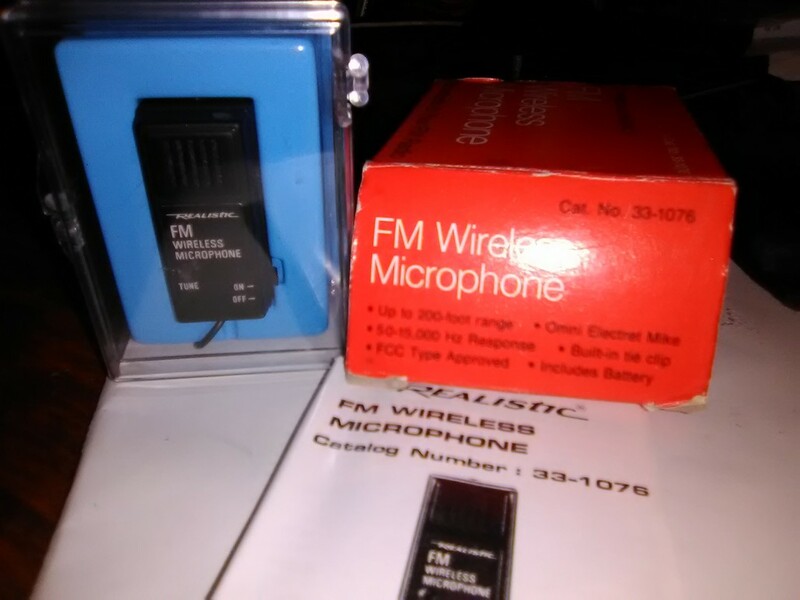 This month we walked away with two vintage Realistic Fm Wireless Microphones for the sweet price of 99 cents each! These are the tiny but bulky lapel microphones Radio Shack sold back in the 90’s for $19.95 and I never bought one because I couldn’t get past the heaviness of this microphone as a lapel mic. The selling points for these gems? The specs to which I won’t type out are as follows in the images below but a couple stand out, Indoor range 100 feet , Outdoor range 200 feet and 50 mV/m at 15 meters……….15 meters?? HUH, interesting. How about the sound quality? Not bad, in fact pretty darn nice considering their age, I will attempt to include either an audio clip or video clip on their sound quality when I have the time. The wire antenna appears to be a little under a foot long and the tuning tool is attatched to the end of the antenna. It does tune 88 to 108 mHz and is of course mono. It takes a button cell or watch battery for 50 hours of use.